Project Ito may seem like a studio name but it’s actually a synonym for Satoshi Ito, a Japanese science fiction writer who produced four novels before his passing in 2009. Most of his books have been translated and released in the UK, including his novelisation of Metal Gear Solid 4. In early 2015 it was announced that his three original novels would be made into anime films, each with their own animation studio and directors to bring the stories to life. 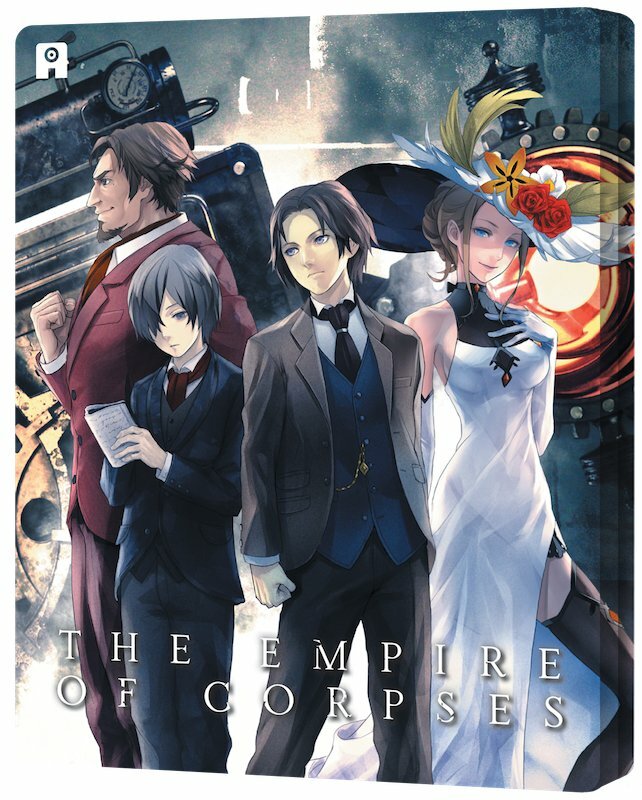 Two of these films so far have been licensed for UK release: Harmony and The Empire of Corpses – not only was the latter’s original book released posthumously but it has not yet been released in English (however, a small sample can be read here.) Luckily each film is its own entity so they do not need to be watched sequentially. Set in the late 19th Century; the great Victor Frankenstein’s technology to raise the dead has become common knowledge. Although the ability to bring back one’s soul has been lost, along with the location of his first creation, the ability to reanimate corpses has become the backbone of society the world over; enabling easily-controlled corpses to do work such as waitressing, carrying cargo to boats, and even serving as soldiers in wars. Dr John Watson is a growing expert in this technology and he has been scouted by the British Empire as an agent to locate Victor’s original notes; however, he’s not the only one searching for such information and many other parties are willing to do whatever it takes to get their hands on it. To make it clear: the main character is John Watson from the Sherlock Holmes books, and besides Victor Frankenstein, there are also cameos from real-life adventurers, presidents and inventors from the same period (for example Fredrick Burnaby). There are characters from classic French and Russian literature such as The Future Eve and The Brothers Karamazov, and a lot more British icons that I won’t spoil. Basically it’s a buffet of characters that join in the worldwide journey to recover Victor’s notes and stop a ‘zombie apocalypse’ (not really, but it’s a similar situation). That premise in itself is crazy enough to be a comic book, or wacky fanfiction, but half the fun is seeing the characters in a new environment outside their norm and having the audience figuring out who’s who – because unless you’ve read the relevant British, American, Russian and French material to know all of the name-drops, you’re only going to get a few. If you have read them all, good on you! You’re in for a treat. Outside of the iconic names however, most of the characters are very different to their original counterparts to the point that many would question why they are even named the same at all. Fredrick Burnaby and the Frankenstein mythos are the closest to their originals; the former maintaining his adventuring spirit and battle prowess, the latter drawing the most heavily from its work in terms of story and mythology. The others have little to nothing in common, but for the majority of the time whilst the movie flows from one stunning location to another, and action scenes keep the pace going, it really doesn’t matter because the characters are interesting in their own right regardless of what material (or country, in terms of the real life people) they come from. John Watson, for instance, is still a doctor but not the post-war Veteran kind, and he doesn’t show any physical health issues until close to the end of the film. However, he maintains his astute senses and curiosity about the unknown. It’s also a breath of air for the character that he’s able to shine alone; John Watson and Sherlock Holmes often come as a package deal for several obvious reasons, but it’s a great idea to let the character stand on his own, allowing him to take charge for once rather than just being in Sherlock’s shadow. We don’t need more Sherlock and Watson stories when we’ve got tons already, but we could do with more Watson tales; especially this one. Adapting a text-heavy source to a visual medium often has lots of complications and issues, and these do not start to become apparent until the second half of the movie. The opening scenes are very engaging and set the tone fantastically, explaining the alternative history that has unfolded. The worldwide journey from England, to India, to Russia, to Tokyo to America not only gives the animators opportunity to really stretch their skills but also creates an epic feel to the whole movie. However, two thirds of the way into the film the characters start to play a cat and mouse game, merely chasing the villain to catch up with him before he does untold damage. That equates to jumping back and forth to locations we’ve already visited, a lot of action scenes with characters breaking into monologues over the top of them, hastily-paced character development and exposition to keep the movie going. It’s clear that there was so much material and world building going on in the original novel that there was simply no room to fit it into a standard movie running time. Enough is explained here and there to grasp the themes, character motivations and understand mostly what’s going on but there are many unanswered questions left at the end. For example, why does Hadaly have the unique powers she exhibits in the second half? What was the full extent of Friday’s and John’s relationship? How did they meet and come to reanimate corpses together? Why did the US president Ulysses Grant want the notes for himself? It’s clear a lot was cut from the source material and some of it was squeezed in to explain plot threads, but a large chunk of it could have been saved if they had dropped the constant travelling back and forth in the latter half. Credit to the production crew for not just having the movie all set in Japan, but the locations for the big finale and the previous fight scenes leading up to it could have been set anywhere so leaving it in one place would have saved a lot of ‘travelling’ animation and unnecessary scenes. Despite the grand finale battle being weighed down by a lot of exposition and unanswered questions, the heart of the story – Watson’s mission to save Friday – remains strong even after repeated watches. Friday never says a word but you can see how much Watson adored his friend even after he’s long gone; Watson’s constant calling after him, the way he looks at him like he expects his friend to suddenly jump back to life, and the tiniest moments from Friday that give Watson hope to go on are really touching, and make the final scene at the very end all the more potent and heartbreaking. Wit Studio (the animators behind Attack on Titan) handled the visuals for this film and it does not disappoint. Aside from the aforementioned welcome changes in locations outside of Japan to set the film, the characters are designed marvellously with the corpses’ dead-eyed look and fractured movements making them appear just human enough to be recognisable but creepy enough to make the viewer wary of them whilst they’re on screen – they’re not just zombies, they’re something more and seeing them moving around with other humans, mostly blending in, is a freaky world to consider living in. Also a big thumbs up to the excellent use of 3D animation for the group corpses that loiter around the film; a common complaint with 3D animation is that it often looks out of place or flat compared to the anime style, but here that works to its advantage. Take the opening scenes, where you have rows and rows of corpse soldiers for example; the 3D-animated corpses look odd to the eye, moving awkwardly and inhumanly, but that’s exactly what they are. It’s a genius move on the studio’s part. There is some use of 3D for the last battle, which goes from high science fiction into fantasy territory, but its implementation makes the finale look as glorious as the story builds it to be. Yoshihiro Ike provides the music for the film, and, like the animators, he gets to work with elements from the various countries the characters visit to his advantage to create a sweeping score. The theme song ‘Door’ by EGOIST is a jazz-inspired slow number that fits very nicely with the heavy British backdrop and mood of the final scene. Speaking of British; applause goes to Funimation for giving the characters the appropriate accents from English to Russian that make them sound as diverse as they are in the story. Although the accents aren’t completely perfect and some actors struggle more than others (you can practically hear Jason Liebrecht’s mind working in overdrive to say the word ‘corpses’ in the English way) it’s great they’ve gone the extra mile for the film, rather than just having everyone speaking in an American accent. On disc extras include movie trailers, promos for other anime properties including Tokyo Ghoul √A and Psycho Pass, and there’s also a Funimation short where four members of the English voice cast discuss the movie, its themes, the characters, and so on. It’s an enjoyable little watch but be sure to watch it after you’ve seen the film as it’s full of spoilers! The collector’s edition comes in a very nice steel case, complete with dual formats and an art book. To summarise it in more modern wording, The Empire of Corpses can be described as a ‘hot mess’; it’s very fast paced with too much location jumping, leading to abrupt character development and world building that looks amazing but isn’t explained fully in the context of the story. The name-dropping of real and fictional characters is often no more than that. However, that doesn’t mean the film isn’t a blast to watch; a thrilling, wacky ride bursting with passion and imagination with lots of lovely Easter Eggs to get whilst watching or discover afterwards. If the idea of British, French, American, Russian characters coming together in one big corpse-slaying army interests you, then check it out. One last note; stay through the credits for an added bonus scene that includes many more glorious cameos which will either have you squealing in joy or scratching your head in confusion. But it’s worth the watch either way.